If you’re used to using Dragon Dictate ( ) for dictating into your favorite programs, you’ll be a bit surprised by Dragon Express, a light version of the program. When you’re done with your dictation, you can then transfer the text to the application of your choice, by clicking one of the icons at the bottom of the window, or by using keyboard shortcuts or voice commands. This works with either the frontmost application, or with one of a number of preset applications, such as Mail (click the Mail icon to create a new email message containing the text you dictate), Facebook (click the icon to post your dictated text to Facebook), and Twitter (click the button to tweet your dictated text), or you can send the text to your Web browser for Google search, to Spotlight to search on your Mac, or to the clipboard. When you click one of these buttons, Dragon Express will switch to the selected application and type your text; curiously, it doesn’t copy and paste the text, but types it, quickly, letter by letter. 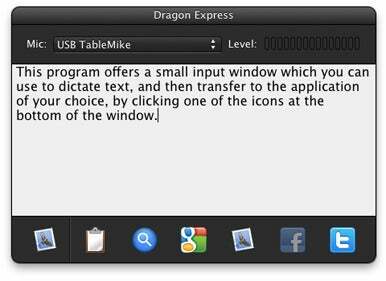 The Dragon Express input window lets you dictate text, then send it to the frontmost application, or to other preset destinations. Like the full-featured Dragon Dictate, Dragon Express invites you to perform a short training period when you first launch the application. The training window displays some text that you read into your microphone. This takes just a couple of minutes, and after that you’re ready to dictate. Unlike Dragon Dictate, however, you cannot correct recognition errors. You can type in the input window to correct mistakes, but Dragon Express will not learn from this. (Nuance told me that correction and additional training will be added in a future version.) In addition, there is no spelling mode, as in Dragon Dictate, which you can use to spell out words (such as proper names) letter by letter, when the program can’t recognize them otherwise. Dragon Express does allow you to train words; you can select one or more words in the input window, right-click, and choose Train Selection. This will help with difficult words (such as your name or the name of a company) that you dictate often, but you wouldn’t want to go through this process for every recognition mistake the program makes. The input window for this program is quite small, and the font size, for my aging eyes, is a bit small. Nuance told me that future versions of the program will offer a resizable input window and that font size will likely be adjustable as well. These two issues make the program difficult to use for people who have very poor eyesight, and who would benefit from using speech recognition. Another thing to note about Dragon Express is that you can use this program to try out speech recognition and see if you like dictating to your Mac. Nuance is currently offering an upgrade path to Dragon Dictate for those who have purchased Dragon Express. If you click on the menu bar icon, then choose more about Dragon, you’ll see that the company currently offers a discount to those upgrading to Dragon Dictate. It should be noted that Nuance launched Dragon Express with a “limited time introductory price.” The company told me that they have not yet decided how long this introductory price will last, nor what the final price will be. Dragon Express does exactly what it claims to do, and does so very well, at an affordable price. Never before has this quality of speech recognition been available to Mac users at such a low cost. While the limitations of Dragon Express will certainly dissuade anyone who wants to perform a lot of dictation—those users are better off with Dragon Dictate—it provides a handy, easy-to-use way to dictate occasional texts and transfer them to your applications.